I was at the barber’s the other day and this old friend of mine I hadn’t seen in YEARS, walked in. It took me a good few seconds to recognize the guy because he’d put on so much weight, he was HUGE! I didn’t want to be blunt, so I kept it vague. “Wow, you’ve changed!” I said. And you know what he said in reply? “Yeh, I’ve put on weight, but don’t worry I’m GONA JOIN THE GYM”. Here’s my motto. If you can’t lose weight at home, you can’t lose weight at the gym. Every worthwhile exercise in the gym, you can do at home. The only difference is the gym takes at least an extra HOUR out of your day. With a one hour workout, that’s 2 hours a day! Who the hell has 2 hours a day to spare for exercise? Who the hell WANTS to spend 2 hours a day on exercise? Especially when this new study shows you can lose weight fast at home, grow muscle and get stronger in less than 10 minutes a day, using zero equipment? This new study by the National Institute of Fitness and Sports in Kanoya, Japan, now PROVES that busy folk like you and me can lose weight and get that lean beach-body without stepping foot into the cold outdoors. Heck, this exercise is so simple, you can do it in the bathroom and no-one will ever know you work out! The study took 94 adolescent Japanese boys and split them into 2 groups. A control group who kept to their usual daily routine, and a training group who did 100 bodyweight squats 4-5 days a week for 8 weeks. By the end of the study, the training group had lowered their body fat count by 4.2% (vs. 0% in the control group), increased lean body mass by 2.7% (vs. 2.0% in control), increased thigh muscle thickness by 3.2% (vs. 0%), increased knee extension strength by 16% (vs. 8%), and increased jump height by 3.4% (vs. 1.8% in the control group). Now what’s really interesting is these boys were already fit and active. They were taking part in competitive active sports like soccer, track and field, swimming and kendo for 1-3 hours a day, 3-7 days a week. These boys didn’t have much fat to lose in the first place, and yet they dropped their body fat count down by a whooping 4.2% with this new exercise. So imagine what effect this simple workout would have on a sedentary overweight adult. It boggles the mind, don’t it? We know that bodyweight squats have been used by many an athlete in the past, not just for losing weight, but for growing big muscles, and developing phenomenal strength, speed and agility. The Great Gama of India did 500 bodyweight squats a day! He was in undefeated in 5,000 matches. The Great Gama of India for example, was reported to have done 500 bodyweight squats a day (some say up to 4,000 squats a day!). 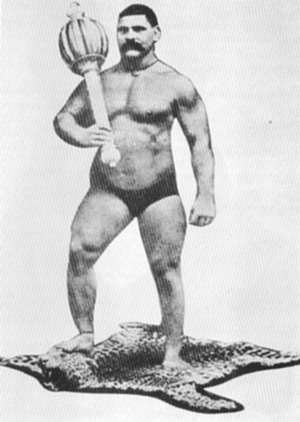 This guy had legs like tree-stumps, and was undefeated in 5,000 wresting matches. WHY Is This Exercise So Effective? Hang on. Don’t you have to jog for 40-60 minutes out in the freezing cold before breakfast to lose body fat? We’ve all tried that method and we know it doesn’t work. You lose some fat in the beginning, but before long your body adjusts and you find you have to jog for longer and longer to make further progress. Truth is, more and more studies are now showing that exercising in the fat-burning “zone” is maybe the LEAST efficient way to get rid of that blubber. The best way forward is a combination of high intensity cardio and resistance training (i.e. lifting weights). Bodyweight squats are the perfect cross between the two. Not only does this exercise get you winded and your heart beating like a racehorse’s, it also makes your thighs burn like they’re being filled with molten iron. A 2.5 minute workout may not seem like much, but don’t let the short time span fool you, these easy-seeming squats can get very intense when you put in the reps.
Are Bodyweight Squats Better Than Sprinting? We know that short, high intensity sprints can help you lose weight VERY fast, but there’s something special about squats that I really think makes them superior. Unlike with sprints, squats take the largest muscle groups in your body (the quads, hamstrings and glutes), and put them through their full range of motion. From what I know about post-exercise hormone release, this would lead to bigger hormonal shifts in your body. It kicks your body’s adaptive mechanisms into overdrive, releasing way more fat-burning and growth-stimulating hormones like testosterone and growth hormone. Plus unlike with sprinting, you don’t need to be outside! What if it’s raining or freezing cold? Bodyweight squats you can do at home and without a treadmill. But Are Bodyweight Squats Better Than WEIGHTED Squats? My personal opinion is weighted squats are better – both for losing weight and for growing muscle and strength. Weighted squats stimulate your body’s adaptive mechanisms more than bodyweight squats. I go into detail about weighted squats in the Chest Sculpting Blueprint. There is a theoretical advantage of bodyweight squats over weighted squats when it comes to fat-loss, and you’d get best results if you did both types of exercise. Mitochondria are the powerhouses in your cells. They are responsible for transforming fats and carbs into energy. This means each mitochondria is like a mini fat-burning furnace. The more mitochondria you have in your muscles, the more efficiently your muscles will burn fat at rest and during exercise. High repetition resistance training also increases the capillary density within your muscles, more so than heavy weight, low repetition training. This means more blood-flow to your muscles, and an increased ability for you body to deliver nutrients to your muscles that would otherwise be stored as fat. If you want the BEST results, do both – weighed squats and bodyweight squats. Studies suggest that combining high resistance training with the endurance effects of bodyweight squats, increases mitochondrial biogenesis beyond just endurance training alone. If, on the other hand, you want something quick, easy and convenient that requires minimal space and no equipment, and still promises sustained fat loss, then you’ll get by just fine with just bodyweight squats. This is my favorite way of doing bodyweight squats. Moving your arms in front as you descend, forces you to hold your torso a little further back to maintain balance. This reduces the involvement of your hips. To further reduce the involvement of your hips, and put more focus on your thighs, you can do the exercise by going on your tip-toes as you go down. The most important thing is to never push yourself too hard, or you’ll end up putting yourself off the exercise psychologically. It’s unlikely you’ll be able to do 100 squats right from the get-go. It’s more likely you can do say 20-30 in one go. So do 20-30, and aim to do 100 in one day, over however many sessions it takes. Without pushing it, over time you’ll find as your leg muscles adapt, you’ll be able to do more reps in one go. Keep at it until you’re doing 100 a day. Do this 4-5 days a week, or even 7 days if you like. You can stick to 100 a day, and you’ll get great results. But why not take it further and challenge yourself to reach higher numbers? After a certain point your legs become so well adapted, that doing squats feels almost like WALKING – you feel like you can do ‘em forever. At this point the mitochondrial and capillary density in your legs are so high that it’ll become difficult for you to put ON weight. Can You Spare 2.5 Minutes A Day? Unlike running, swimming, or using weights, you can do bodyweight squats ANYWHERE. The best thing is it’s over in a couple of minutes and you don’t even break a sweat! – so there’s no need to shower. This exercise goes beyond just helping you to lose weight fast at home. You can do squats when you’re out and about, say in a restroom stall after a heavy meal in a restaurant. So go give it a try. Why not do a set right now and let me know how it feels in the comments section below. I personally find it kills my thighs, lower back and calves. I feel it in my thighs the most, what about you? Are Squats Alone Enough For All Your Weight Loss Needs? They can be for some, but you’d get far better and far quicker results if you combined squats with other powerful testosterone-boosting exercises. So does this go the same for high reps with push ups? Hi Tyler, thanks for your question. To an extent, yes. High rep push-ups will help you grow chest muscle and even build strength. But the muscle growth you get with high rep push ups will not be as impressive as the muscle growth you get with high rep bodyweight squats. This is because your legs contain a higher proportion of slow twitch endurance fibers, while your chest has mostly fast twitch strength fibers, which respond better to heavier weights.